Chicken is such a versatile meat; we enjoy it in many of its iterations from simple roast to this delicious Greek- inspired version chock full of flavor (and healthy veggies). You can buy pre-cut chicken pieces or buy a whole chicken and cut it up yourself. I like doing it that way as it’s fresher and less expensive. Plus I skin my chickens before cooking as well. Something I learned is not to rinse chicken in advance of cooking- it just spreads any bacteria. Cooking itself kills whatever is on the poultry. Do clean your knives (or kitchen scissors, cleavers, etc.) and boards thoroughly with hot water and detergent. 2. 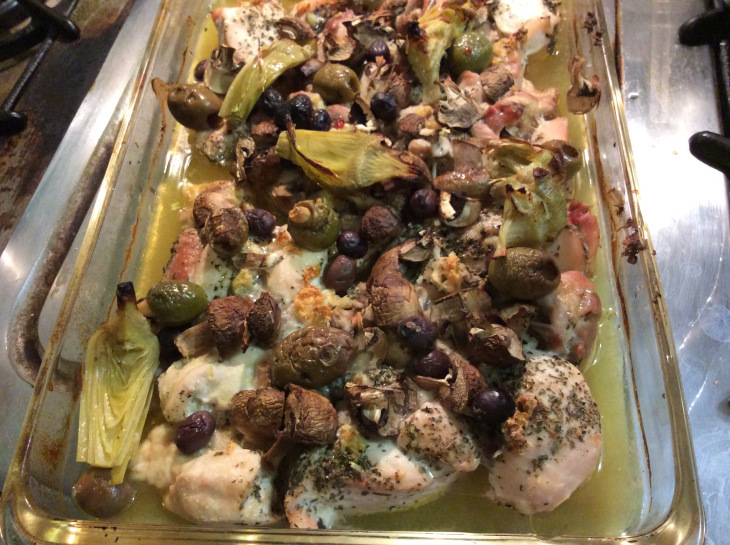 Mix garlic, artichokes, mushrooms and add to chicken. 3. Pour wine and lemon juice over chicken and vegetables. 5. Sprinkle herbs, spices and seasonings on top to taste. 6. Cover with aluminum foil- bake for 25 minutes.